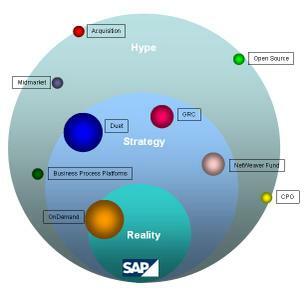 SAP's telling us there is new corporate world order coming. It's a world driven top down by process and not bottom up by technology. Your IT department may be ready, but is your organization? As you all know, I've been at the SAPPHIRE conference as an officially sanctioned "from the floor" blogger. This experience has been unbelievable in more ways than I can articulate and I will be trickling out thoughts and articles about what I have learned over the next few days. I have been blown away by how open and welcoming SAP has been to the blogger community and how aware the company at all levels has been of our presence (and by implication, possible influence). Two examples that have been priceless. First, at the official SAP press conference yesterday (covered in real time by Ross on his blog), the announcer officially welcomed us bloggers to the conference in front of the whole press corps and the industry analysts. I took full advantage of this perhaps historical moment by standing up and lobbing a question at Shai (I have a piece coming about what I asked and why I asked it). I think for all of us, it was pretty unusual to hear an introduction at a the press conference of a 70 billion market cap company that went something like this, "Hello, my name is Niel Robertson, Newmerix Corp, and I am a blogger." Heads turned and frankly it probably sounded more like my first Bloggers Anonymous meeting than something you'd hear at an SAP press conference. Thanks to Vinnie for backing me up with another question from the blogger "brotherhood" making our presence undeniably known by all. As a second priceless moment, I had the chance to go to the SAP Executive Press and Analysts (and Blogger) dinner last night. It was well attended by all, including the SAP executive team. Special thanks to Geoff Kerr (VP Communications, SAP Labs), who did a fantastic job of wisking me around to essentially meet the whole executive team (Hasso included) and key influencers, inserting me into their conversations the minute they came up for air. At one moment though, i saw Henning Kagermann relatively alone by the bar. Frankly, meeting people at a bar (whether they are women, CEOs of billion dollar software companies, or both) has never really been my cup-o-tea. But i figured, I'd better take this moment because I would not get it again. I walked up, inserted a handshake into the conversation and off we went. I expected a few pleasantries, possibly a business card exchange, and i'd be off with a good story for my friends. My opening question was simply, "What do you think about blogging and how it affects SAP?" I have heard that Henning, "the professor" as many refer to him, is a determinately inquisitive man. And true to his legend, he lived up to. His first response was "I'm neutral." Then, after a moment of thought, he grabbed me by the arm and walked me out off the bar into the hallway. Being whisked out of a bar by the CEO of SAP, it might have been safe to assume that he had quickly changed his mind from “neutral” to something more negative after seeing me (and all this time I thought I cleaned up so well). In reality, his purpose was quite the opposite. We had a very detailed one on one conversation for 10 minutes or so about blogging, his concerns and expectations with regard to it, major drivers for the future at SAP, and his team and the special areas that I was interested in talking about with them. When all was said and done, he turned to me and said “I’m just very interested; you’re the first blogger I’ve ever talked to [about blogging].” Priceless! And i have to say I was as impressed with Henning as I have been told that I would be. I was all over the map from blogging metrics to the evolution of application platforms to the commoditization of development tools and the opposing value creation through business process knowledge. The man never missed a single beat with me the whole time. To give some more detail though on blogging, Henning's primary concern about bloggers was that they are prone to write opinion as opposed to researched positions. This is a very fair concern and I talked with a number of people that night about this issue, including how it is a general impediment to bloggers who want to become a standard part of our industry’s media channel. I assured Henning of two things. First, Jeff Nolan was very thoughtful about who he invited to the conference. The group we have takes their time, researches widely, and rarely takes a position without vetting it first. Simply come over to the bloggers corner and you can see this in action. After one of us has an interview with an SAP executive, we come back to the table, explain what we have learned and let the blogger corps poke and prod at it. By the time it gets to print, we've had the collective wisdom of over a 100 years of enterprise software knowledge helping form our opinions. This process is one of the reasons why you don’t see much instant reporting of what’s going on at the conference. I would expect that our blog pieces will start to appear in rapid fashion this weekend as we have time to process and write down well formed thoughts. Second, for those of you who know my blarticles, my goal is to synthesize. While the process of synthesis does not remove all opinion and bias, it does expose to me areas that I need to learn more about before I write something that may be wrong. With all that said, the point is this: I’m having a ball. I’ve got about 20 pages of notes from talking to SAP executives and I’m about to start getting it all down in the blog. Stay tuned, more to come very soon! One of my best friends, Matt Cutler, told me a while ago about the concept of the "Lazy Web". The basic idea was spawned (at least in Matt's description of it) from a friend of his who wanted to get some pictures of a local airshow. He figured, "Why should I take them myself?" Someone else will probably take them and put them on Flickr. Low and behold, the day after the airshow, pictures appeared on Flickr. There is even an official LazyWeb site set up now for this type of thing (I have no idea if there is a connection to Matt's friend). Anyway - i'm here to offer you a direct Lazy Web interface right into SAPPHIRE 06. Jeff and Mike at SAP have provided a few of us bloggers with unparalleled access to executives, the show floor, evening dinners, etc.. Its really quite unbelievable. If you have questions you'd like me to ask them, please send them in (comments to the post will do just fine or you can email me directly at [email protected] if you'd like). In addition, if you're taking photos at the conference, please put them on Flickr. Please use the Flickr tag, "sapphire06". You can see all of these Flickr photos on the SAPPHIRE 06 Fliki page (Ross Mayfield, CEO of SocialText, our wiki provider, will probably roll his eyes at this spontaeous portmanteau). I have to hand it to SocialText, the feed integration with their wiki software is extremely cool! Also of note: for the first time this year, ASUG is being co-hosted with SAP's SAPPHIRE conference. ASUG, or the America's SAP User Group, is the rough equivalent to PeopleSoft's RUGs, JDE's Quest, OAUG (Oracle Applications User Group), or IOUG (Interational Oracle Users Group). They too have a blog. I'm not sure if it is open, who's posting, etc.. but thought I'd give you the link to check out. Stay tuned, this is going to be fun. Also - some of the bloggers are showing their hand a bit on what they want to write about. I'll try to point out the best posts that we all come up with while we're here over the next few days.